For some reason, I have been encountering a lot of people lately who simply can not believe that they can become debt free. They present numerous reasons as to why they can not become debt free – income, uncooperative spouse, children, huge home mortgage, student loans, interest rates on various loans, and the fact that it takes too long. I agree that all of these reasons can create obstacles to achieving debt freedom, but NONE has the ability to prevent you from becoming debt free. ALL of them can be addressed. ALL of them might require tough, hard, and gut-wrenching decisions, but it is worth it to become free from debt! If freedom from debt is your goal, you CAN do it! I believe that one of the most important things one can do when launching their Debt Freedom March is to prepare a written spending plan every single month. If today is the day that you are going to start planning your spending, I recommend that you read the series of posts I wrote titled "How Do I Budget?". Chances are that if you have already launched your March To Debt Freedom, you have encountered the naysayers who say it is not possible. Stick with it! It is so worth it. In summary, let me just say that I have been Debt-Free (except for the house) and LOVING IT since February 2004. Joe: Maybe it’s time to start of series on these issues: lack of income, uncooperative spouse, children, huge home mortgage, student loans, interest rates on various loans, and the fact that it takes too long, either collectively or individually. While each has a common root the reason for allowing them to keep one from working to be debt free, each has it’s own distinct characteristics that need to be addressed. I’ve been hearing a lot of this attitude too. NO ONE can be debt freeâ€¦â€¦Iâ€™m beginning to think they just donâ€™t WANT to!!! I explained to the last person I heard this from about car payments. You know, the fact that most people spend $475 per month in car payments. Over 40 years, this car cost them what, 5.5 million. That stopped them in their tracks. They could not image, NOT having a car payment, but 5.5 million dollars made them listen. You see they live with a disease called newcar syndrome. I also asked them how they would like to bring home their entire pay check and only have to pay utilities (this is what made me seek debt-freedom). You could see the raised eyebrowâ€¦â€¦Hmmmm look. 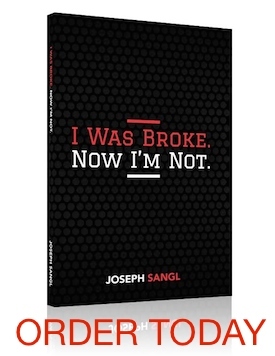 I explained more about Dave Ramsey and this wildly popular guy called Joe Sangl and they started to listen. They said they wanted to know more, I could tell their interest was peaked. I hope I hear from them soon. “uncooperative spouse” I think that’s the big one, some people want to clean up their mess (debt) however they need help and when both of you are not on board it fails. I don’t care how much debt you knock out or how much saving you build up. With a spouse not helping you feel you are not getting nowhere. I do agree that you should do a series on these issues. Also… I do think the “uncooperative spouse” is probably one of the most difficult and I would love to see other peoples thoughts on how to deal with that.